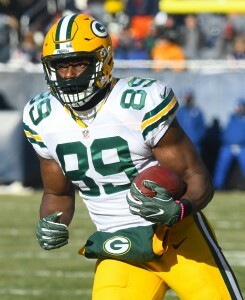 We heard at the end of January that the Packers would make re-signing tight end Jared Cook a priority, and just yesterday we learned that Green Bay contract negotiator Russ Ball met with Cook’s agent (along with the agents for some of the club’s other top UFAs). But as Jason Cole of Bleacher Report tweets, although the two sides are talking, there has not been much progress towards a new deal. Indeed, Cole makes it sound as if the Packers are low-balling Cook, as he writes that Green Bay is being “frugal” at the moment. Cook signed a modest one-year, $2.75MM contract with the Packers last offseason, which was quite a step back from the five-year, $35.1MM deal he signed with the Rams back in 2013. But while his first year in Green Bay was partially derailed by an ankle injury, he really turned it on during the Packers’ playoff run, piling up 13 receptions for 181 yards and two scores in two games. He finished the regular season with 30 catches (on 51 targets), 377 yards, and a touchdown. His postseason explosion, though, figures to get him a multi-year pact, as he demonstrated the ability that led to his early-career success with the Titans and that convinced the Rams to hand him a lucrative free agent contract. PFR ranks Cook as the second-best tight end eligible for free agency, right behind the Patriots’ Martellus Bennett. Spotrac.com believes Cook is worth a four-year deal, $13.77MM deal. But he may have more value than that for the Packers, who know just how deadly Aaron Rodgers can be with a talented tight end at his disposal. Green Bay lowballing is no surprise to anyone. TT would be stupid not to resign him. Tim Tebow? He is the Packers’ GM now?! And plays for the Mets? And is an ESPN commentator for NCAAFB? Impressive. the difference between packers GM and bill belichick of the Patriots is that belichick uses FREE AGENCY and is not afraid to mack a trade to fill a week spot in the team and Thompson doesn’t. the only timeThompson used free agency to bring in more than one key player was when they brought in Ryan Pickett and Charles Woodson an they filled key spots on the team and they won a supper bowl when was the Last time are wonderful gm did anything to help fill week spots on defense you can’t do it all thru the DRAFT. You build your team and your foundation through the draft. Trust the process…. it’s been proven to work. Besides why blow money with big contracts when you can spend big money on your own players. Dump Cook and sign Bennett. Immediate and major upgrade at TE. TT would never spend the money it would take to get Bennett. He’ll probably do something stupid like resign Peppers instead.